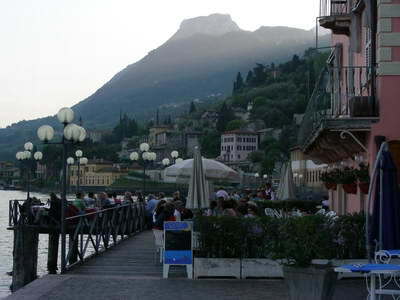 "Gargnano is a charming, unspoilt small town with lots of appeal"
Gargnano is quite a small place located in front of very steep mountains and down to the lake edge. Consequently, it is quite a tight, compact place with little free space and narrow streets. This, combined with the fact that there is not much room for any new development, means it is a charming town that gives a sense of stepping back in time. It is very small, but nice, port area from which there is a long boardwalk overhanging the edge of the lake. This is a favourite place to eat and gaze over the lake in the evenings. We have enjoyed eating here and it is also a very handy place to get to from the nearby ferry terminal. The streets are very narrow and full of character. We found there were some great shops tucked away down these streets and it is a charming place to wander round. There are also some lovely properties down on the lakeside and the villa Feltrinelli (featured on the exclusive villas scetion) is one of most wonderful places to stay on the Lake. There is a bit less tourist traffic here than some areas, but there is only one road through so it can get busy. There is a small multi-level car park just to the south of the town centre, but apart from that it's the usual chance-your-luck scenario! So overall, it's not as picture-perfect or impressive architecturally as some towns, but it's full of character and charm, and very much unspoilt and quieter than other places. 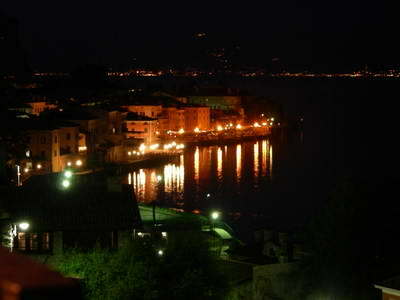 Click here to go from Gargnano to the home page.